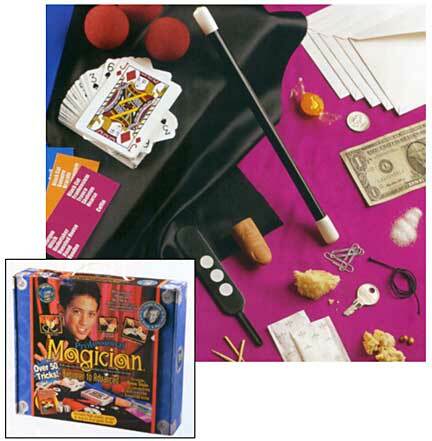 The Professional Magician set will get you started as a magician with over 50 magic tricks. Learn card tricks, rope tricks, sponge ball magic, paddle tricks, and much more. The set is a step-by-step guide that you can learn at your own pace, taking you from beginner to advanced. The box becomes a portable carry case that keeps your props organized and doubles as a table-top stage. The Professional Magician set was developed in collaboration with professional magician Ian McCoy and is a perfect way for young entertainers to get started with this exciting hobby or, maybe, profession! Contents include: Magician's handbook, red silk handkerchief, blue handkerchief, standard deck of cards, 3 dice, silver disc, safety pin, magic wand, 4 sponge balls, mind reading cards, 3 strands of rope, fake thumb tip, magic paddle, deluxe magician's black cloth, and carry case/stage. 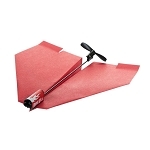 The handbook includes many other tricks you can perform with household items.